GaryMoller.com - Health, Fitness - Naturally! : The Fosamax lawsuits are now in progress! The Fosamax lawsuits are now in progress! There are now almost 1,000 separate lawsuits in the USA alleging that Fosamax caused harm. This harm includes osteonecrosis of the jaw - a horrific condition where the bone of the jaw dies, causing disintegration of the jaw - Horrific! This is stuff right out of a horror movie. This harm is not isolated to Fosamax alone, Fosamax is a member of the class of drugs known as "bisphosphonates". These drugs are widely prescribed in New Zealand. For more about these drugs, please read the long list of articles I have written here about these horrible drugs - there is nothing positive one can say about them. Sadly, despite all the dire warnings, doctors continue to prescribe these to trusting patients. During his March 5, 2012 opening statement the plaintiff's attorney, Tim O'Brien, told members of the jury numerous times that Fosamax did nothing for Jo Ann Sessner, it only did something to her. 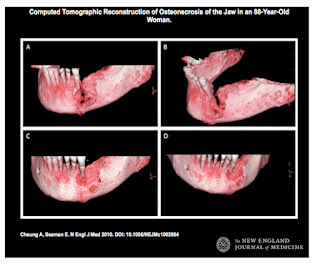 It is alleged in this Fosamax lawsuit -- Jo Ann Sessner vs. Merck Sharp & Dohme Corp., ATL-L-3394-11 (MT), which is currently ongoing in a New Jersey state court, with Judge Carol Higbee presiding -- that the osteonecrosis of the jaw (ONJ) which Mrs. Sessner developed was caused by her six years of Fosamax use. In medical terms, this condition is known generally as "bisphosphonate-related osteonecrosis of the jaw" (BRONJ). To clarify what is meant by this contention that "Fosamax did nothing for Jo Ann Sessner, it only did something to her", the plaintiffs will introduce evidence during this Sessner Fosamax - ONJ trial that Merck's osteoporosis medication does nothing beneficial for a patient with osteoporosis after 36 months, or three years, of use in terms of preventing fractures. Moreover, if that patient really only had osteopenia, and not osteoporosis, then there was never really any medical benefit gained from taking Fosamax, according to other evidence that the plaintiffs will put on during this Sessner trial. Therefore, and this is presuming that Mrs. Sessner had osteoporosis (and not just osteopenia), after the first three years that she used Fosamax -- or, to put it otherwise, during the immediate three years before she was diagnosed with ONJ -- Fosamax was not helping Mrs. Sessner but only hurt her by causing the ONJ, which was vividly described by Mr. O'Brien in his opening statement as "a disfiguring, a disabling, and a life-changing disease". Well, as it turns out (unfortunately), Mrs. Sessner has plenty of company in terms of the number of women who have been diagnosed with ONJ associated with Fosamax. This evidence will be developed by the plaintiff's attorneys during the second week of this Fosamax - ONJ Sessner trial currently ongoing in a New Jersey state court. Note: Courtroom View Network (CVN) has cameras that are webcasting the Sessner trial from Judge Higbee's courtroom in New Jersey to attorneys and other interested persons around the country. I want to thank CVN for providing this remote access as it allows me to view and report on the Sessner trial without having to actually be there. This is astounding. I don't think I know anyone who has taken it, but I am glad that I have this information for my family at the very least. Mike, please pass the message. Far from being "anti-Dr" my wish is that all work for the best interests of their patients and not for the interests of big business. If a Dr can not fully and/or sincerely answer several basic questions about a drug, then he/she should not be prescribing them.